Liv Tyler's (1977-) acting career has been remarkably diverse, encompassing a wide variety of different film genres. Due to her prolific and meticulously crafted body of work, she has clearly illustrated an increasingly versatile range of acting skills through her acute emotional observation and constant eagerness to experiment. This book examines Liv Tyler's cinematic work from her debut in 1994 through to 2005, and discusses her many appearances in films including Armageddon, Onegin, One Night at McCool's, Empire Records and The Lord of the Rings trilogy. Covering her first seventeen performances on the big screen, Liv Tyler's acting style and critical reception are analysed in depth, and her contribution to modern cinema thoroughly assessed. 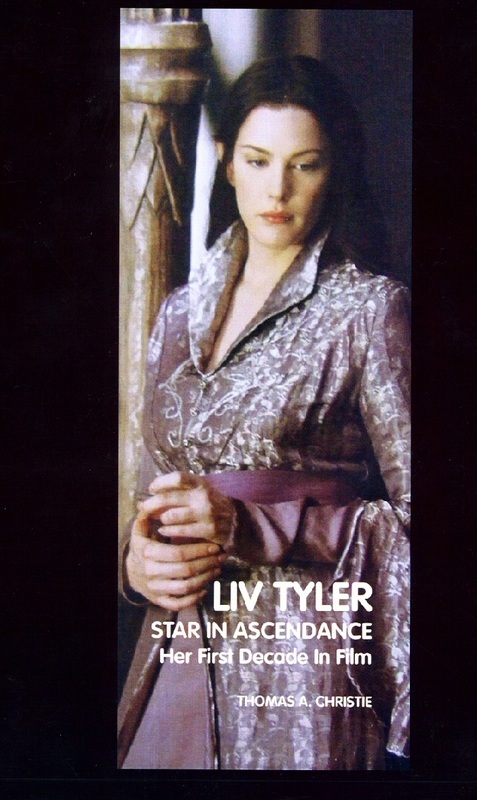 Liv Tyler: Star in Ascendance discusses Liv Tyler's performances in each of the films that she appeared in between 1994 and 2005. There are separate chapters focusing on all of the following films: Bruce Beresford's Silent Fall (1994), James Mangold's Heavy (1995), Allan Moyle's Empire Records (1995), Bernardo Bertolucci's Stealing Beauty (1996), Tom Hanks's That Thing You Do! (1996), Pat O'Connor's Inventing the Abbotts (1997), Michael Bay's Armageddon (1998), Jake Scott's Plunkett and Macleane (1999), Robert Altman's Cookie's Fortune (1999), Martha Fiennes's Onegin (1999), Robert Altman's Dr T and the Women (2000), Harald Zwart's One Night at McCool's (2001), Peter Jackson's The Lord of the Rings Trilogy (featuring The Fellowship of the Ring, 2001; The Two Towers, 2002, and The Return of the King, 2003), Kevin Smith's Jersey Girl (2004), and Steve Buscemi's Lonesome Jim (2005). This was my first book to be published. It was written alongside my Master's degree dissertation, which was also film-related but - in contrast to this book - was much more closely concerned with politics and ideology. I was keen at the time to explore other avenues of film, and performance was one area that really fascinated me. I felt that it would be interesting to follow the career of one actor over a particular period of time, to consider exactly what factors had brought that performer to prominence in the film industry. As there were already many such studies for long-established actors from Hollywood's golden age, I was keen to choose a more modern figure who perhaps hadn't received as much analytical attention. Liv Tyler was prominent in the showbiz news at the time, having given birth to her first child and announcing that she would be taking a hiatus from the film industry for a while. She was firmly at the forefront of the Hollywood A-List due to her appearance as Arwen Undomiel in Peter Jackson's monumentally successful Lord of the Rings trilogy, and I also remembered having been greatly impressed by her quietly powerful performance as Tatyana Larina in Martha Fiennes's Pushkin adaptation Onegin (1999) some years beforehand. After some further research, I realised that she had made her cinematic debut in 1994, which was more or less exactly a decade beforehand. This would give a finite scope to a study of her career to date, and lent itself to an analysis of how a performer could go from being a new and untried actor to a global superstar in little more than ten years. Upon studying the films that she had appeared in I was soon to discover that her acting talents were both subtle and versatile, and that she had shifted effortlessly from genre to genre over the years with considerable grace, picking up several awards along the way. I completed the book shortly before graduating with my Master's degree, and marketed it for a few months before it was accepted for publication by Crescent Moon Publishing. Liv Tyler: Star in Ascendance received its official book launch at the Stirling Smith Art Gallery and Museum on 28 September 2007.